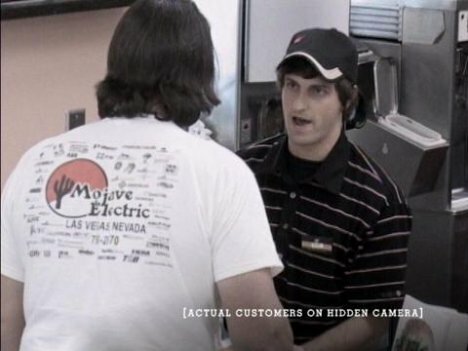 Burger King celebrated the 50th anniversary of the Whopper in 2007 by showing the reactions of real customers in Las Vegas to the news that the Whopper had been discontinued. On October 30, 2007, hidden film crews captured the reactions to news that their burger would no longer be available. In some cases burgers were replaced by a Wendys Single or a McDonalds Big Mac. The result was branded as the Whopper Freakout and featured online at www.whopperfreakout.com. One of the shots showed Regan Burns, known for his role in the television show Oblivious, playing a cashier. The Burger King Whopper Freakout campaign was developed at Crispin Porter + Bogusky, Miami, by creative directors Rob Reilly and Bill Wright, copywriters Ryan Kutscher, Omid Farhang and Nathan Dills, art directors Paul Caiozzo, Andy Minisman, Dan Treichel and Julia Hoffman, agency producers Dave Rolfe, Winston Binch, Chris Kyriakos, Aymi Beltramo and Bill Meadows, account supervisors Stewart Warner and James Luckensow. Filming was directed by Henry-Alex Rubin via Smuggler, New York, with director of photography Learan Kahanov, producers Patrick M Smith, Brian Carmody, Lisa Rich, Allison Kunzman, and Laura Thoel. The interactive campaign was developed at Red Interactive Agency, Santa Monica, by Scott Prindle, Matthew Ray, Matt Walsh and Michael Tse. Editing was done at Rock Paper Scissors by Adam Pertofsky, Chan Hatcher, Matt Murphy and Wyatt Jones, with assistant editors Dan Aronin, Gabriel Britz and Neil Meiklejoh. Post Production at Riot was done by Crissy DeSimone and Tricia Sanzaro, Mark Dennison, Andy Davis. Animation was done at Lifelong Friendship Society by Dan Sormani with producers Stephanie Boggs and Jessica Loc. Sound was designed at Lime Studios by Dave Wagg, Rohan Young, Loren Silber and Mark Meyuhas. Music was written by Eugen Cho at Amber Music.